Home > Academics > College of Arts and Sciences > Philosophy Department > Faculty > J. Patrick Mohr, S.J. Fr. Mohr entered the Society of Jesus (Jesuits) in 1957, and received Bachelor's and Master's degrees in Philosophy from Spring Hill College in 1963 and 1964 respectively. Three years of teaching chemistry at St. Joseph's Preparatory School in Philadelphia, PA were followed by more studies in philosophy, in which subject he received a Ph.D. from Georgetown in 1974. 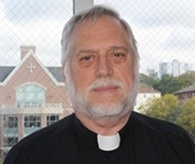 Studies in theology at Woodstock College, Maryland in 1967 and Regis College in Toronto from 1973 to 1975 preceded his ordination to the priesthood in the Roman Catholic Church in 1975 and he began teaching in the philosophy department at the University of Scranton that year. The courses he has taught over the years are Introduction to Philosophy, Existentialism, Modern Philosophy, Philosophy of Religion, and Medical Ethics. His principal research interest is hermeneutic ontology, and his major publications "The Sacrament gives rise to Thought: Some Implications of Hegel's understanding of the Sacrament of Communion for his philosophy," and "Ultimate Reality and the Cave Analogy in Plato's Republic" flow from that interest. Fr. Mohr is a member of the Scranton Jesuit Community. His most important contribution to the University of Scranton is daily celebration of the Eucharist and weekly hearing of confessions in the University chapels. This enables students and teachers to fulfill the ideal of Jesuit education stated in the Jesuit Constitutions of monthly confession and daily Mass so that students may experience the loving forgiveness and bodily presence of Our God and Savior, Jesus Christ.